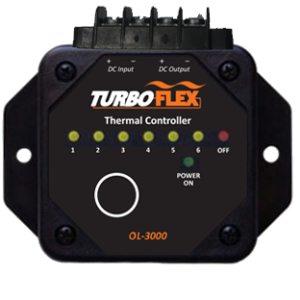 TurboFlex’s CL 3500 thermal controller provides easy-to-use, single-button adjustment to advance by pre-set increments. This controller is ideal for OEMs that do not have sophisticated thermal control requirements, engineers and product developers who are experimenting with thermal requirements of their design. Enter a temperature (°F) for each of six fields. Temperature should be between -20°F and 650°F. The controller utilizes the input power of the heater without the need for a separate power supply. Output power to the heater shifts from full power during ramp-up to PWM (Pulse Width Modulation) during its hold state. 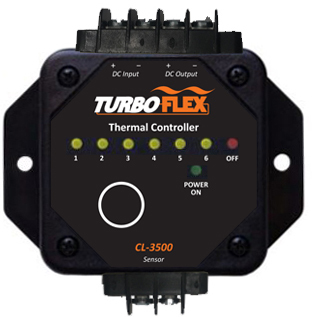 The CL 3500 is custom-programmed with six specific temperature settings defined by the customer. Customers will be prompted to add the temperature settings within the online shopping cart.